A pine is any conifer in the genus Pinus (/ˈpiːnuːs/) of the family Pinaceae. 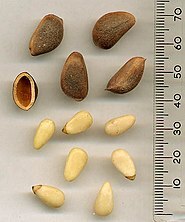 Pinus is the sole genus in the subfamily Pinoideae. The Plant List compiled by the Royal Botanic Gardens, Kew and Missouri Botanical Garden accepts 126 species names of pines as current, together with 35 unresolved species and many more synonyms. See List of Pinus species for complete taxonomy to species level. See list of pines by region for list of species by geographic distribution. Pines are long lived and typically reach ages of 100–1,000 years, some even more. The longest-lived is the Great Basin bristlecone pine, Pinus longaeva. One individual of this species, dubbed "Methuselah", is one of the world's oldest living organisms at around 4,600 years old. This tree can be found in the White Mountains of California. An older tree, now cut down, was dated at 4,900 years old. It was discovered in a grove beneath Wheeler Peak and it is now known as "Prometheus" after the Greek immortal. Many pine species make attractive ornamental plantings for parks and larger gardens with a variety of dwarf cultivars being suitable for smaller spaces. Pines are also commercially grown and harvested for Christmas trees. Pine cones, the largest and most durable of all conifer cones, are craft favorites. Pine boughs, appreciated especially in wintertime for their pleasant smell and greenery, are popularly cut for decorations. Pine needles are also used for making decorative articles such as baskets, trays, pots, etc, and during the U.S. Civil War, the needles of the longleaf pine "Georgia pine" were widely employed in this. This originally Native American skill is now being replicated across the world. Pine needle handicrafts are made in the US, Canada, Mexico, Nicaragua, and India. Pine needles are also versatile and have been used by Latvian designer Tamara Orjola to create different biodegradable products including paper, furniture, textiles and dye. ^ "The Plant List Version 1.1". Retrieved 15 December 2015. ^ Ryan, Michael; David M. Richardson (December 1999). "The Complete Pine". BioScience. 49 (12): 1023–1024. doi:10.2307/1313736. JSTOR 1313736. ^ a b Burton Verne Barnes; Warren Herbert Wagner (January 2004). Michigan Trees: A Guide to the Trees of the Great Lakes Region. University of Michigan Press. pp. 81–. ISBN 978-0-472-08921-5. Archived from the original on 2016-05-11. ^ a b c Filipiak, Michał (2016-01-01). "Pollen Stoichiometry May Influence Detrital Terrestrial and Aquatic Food Webs". Behavioral and Evolutionary Ecology. 4: 138. doi:10.3389/fevo.2016.00138. ^ Solanki, Seetal (2018-12-17). "5 radical material innovations that will shape tomorrow". CNN Style. Retrieved 2018-12-17. ^ ULUKANLI, Zeynep; KARABÖRKLÜ, Salih; BOZOK, Fuat; ATES, Burhan; ERDOGAN, Selim; CENET, Menderes; KARAASLAN, Merve Göksin (December 2014). "Chemical composition, antimicrobial, insecticidal, phytotoxic and antioxidant activities of Mediterranean Pinus brutia and Pinus pinea resin essential oils". Chinese Journal of Natural Medicines. 12 (12): 901–910. doi:10.1016/s1875-5364(14)60133-3. ISSN 1875-5364. PMID 25556061. Mirov, N. T.; Stanley, R. G. (1959). 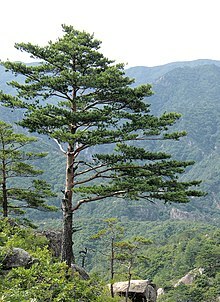 "The Pine Tree". Annual Review of Plant Physiology. 10: 223–238. doi:10.1146/annurev.pp.10.060159.001255.